posted on Friday, June 22, 2012 @ 2:31 PM | 0 comment(s) | add a comment. 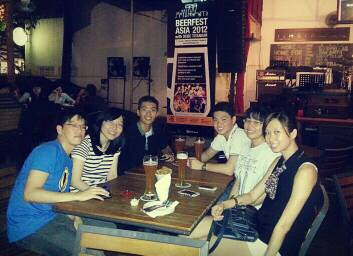 Gathering with some of the E7s that day! I call it a bonding session lol. JK. So after finding K for lunch, we went to do all the oh-so-secondaryschool activities!! Pool, LAN(ya it was my first time there!!) Quite interesting hahaha. Sometimes I think I know why there's a saying "Secondary school friends are your friends for life".. Perhaps it is because we practically "grew up" together? So there's a tendency that we are really comfortable with each other..
Hope we have a great time next week, and more to come! » Just some of my work.